MOTIONrehab Hull team Julie, Stu and Tom pictured with Paul from PAUL for Brain Recovery. On Saturday 21st July, the MOTIONrehab team from Hull attended the PAUL for Brain Recovery’s Charity event Party in the Park at The Country Park, Hessle Foreshore. 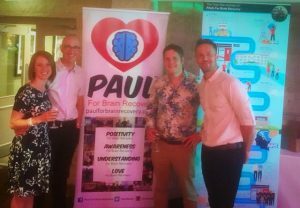 PAUL for Brain Recovery is a fantastic charity who’s mission is to make life easier after brain injury by providing advice and support to empower all affected by brain injury. We also campaign to improve services, raise awareness and promote understanding of brain injury. The charity was founded by Paul Spence after suffering a brain injury in 2012. Paul started the charity in order to provide support to others within the brain injury community. With a unique understanding of the difficulties people face during recovery. Paulis on hand to offer support, insight, advice and guidance to everyone who has suffered a brain injury. Paul is a tireless campaigner for ensuring sufficient support for the brain injured community.